Matching tartan flashes are supplied free, providing there is sufficient surplus cloth after finishing the kilt. Is it pure wool? The eight yards of pure wool tartan cloth needed to make a kilt accounts for a large percentage of the final price I charge. If you find a much cheaper pure wool eight yard made to measure kilt, it is likely you will only have the choice of a small number of tartans. Is it completely hand sewn? Retailers can misleadingly describe a kilt as hand finished when it is mostly machine sewn with merely the buckles and straps sewn on by hand. Are there any hidden extras? Some websites will quote you what seems like a reasonable price only to add a surcharge for hand sewing or pleating to the stripe when you come to pay for your order. And finally: Is it made in Scotland? Beware of the misleading 'Designed in Scotland' label. 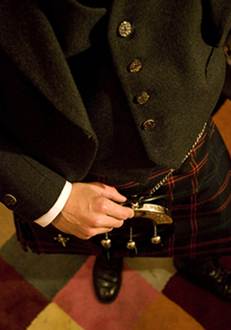 My kilts are made from my home in the Highlands and customers are welcome to visit for fittings. Customers who are unable to visit should instead follow the detailed instructions for measuring given on this site. All highland outfits and accessories are from Scottish suppliers and made in Scotland. All jackets are 100% pure new wool. Please call or email to discuss any requirements. There are many options when choosing your outfit and I will be happy to give advice. After receiving your enquiry, I will contact you via phone or e-mail and confirm any order. On confirmation I will require either payment in full or a 50% non-refundable deposit with the remainder due before dispatch of your goods. Postage costs will be advised in advance and added to your final bill. Payment must be made in Pounds Sterling only. You can pay with your credit card through Paypal (surcharge applies), by personal cheque or by bank transfer. Waiting time for each kilt will be 6-8 weeks on average, providing your chosen tartan is in stock. A faster turnaround can sometimes be accommodated in special circumstances. When goods are faulty and in line with current UK laws, Rendall's of Lochalsh will make full restitution by way of a full refund or replacement of the goods concerned. We will of course cover the postal charges incurred by the customer. Where the fault is with inaccurate measurements, we will try to make good the inaccuracy, however any additional charges incurred by us must be met by the customer.